Tamilnadu of that period. It also refers to a "Natya Nanool"
Further the commentator of this Epic namely Adiyarkku Nallaar too provides useful informations on the Dance Forms of Tamil Nadu of the relevent period. belonging to the Sangam period of Tamil Nadu. 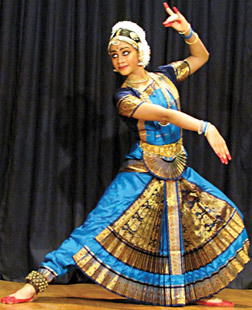 Veththiyal - Dance performed for the kings and nobles. Pothuviyal - Dance performed for the common people. earlier but lost even during his period. the period too is lost to us today. recovery. However the major part of this work has now been preserved. treatise as that of the Sangam period. balance chapters is not known to us today. their possibilities and limitations as a theoretical art and craft. dance in single and group patterns, Vasai Vari - ludicrous dances. modifications, such as horripilations, tremors etc. kalasas (varpu) or angaharas, 9 thandavas in full and 6 lasyas. makeup, green room problems, etc. remaining seven valuable chapters of this treatise is unknown. the Sangam Period for the benefit of or Tamilians. be found in any ancient Tamil Literary work known to us. respective fields and make their own deductions with help of same. im enal isaiye iyalvathu thalam. There are also further references to Siva, Sakthi, Thirumal and Murukan. on Tamil Dance in to print. In my efforts to trace the balance chapters of this valued original Tamil Dance Treatise belonging to the Sangam period of Tamil Nadu, I came to know that the Tamil Nadu Sangitha Nataka Sangam who publised the first part of the Kooththa Nool - is now known as the Tamil Nadu Iyal Isai Naataka Mantram and is located at Chennai - 28. After the death of Thiru S.Yogiyar this Mantram obtained all the manuscripts of this Treatise that was left with Thirumathi Yogiyar, and with her kind permission published only the Text of the available lot of chapters "as they are", without editing or giving any explanatory notes or commentry on same - as Part 2. The first part of this treatise publised by them has 162 Sooththirams. The second part publised by them has 1339 Soothirams on Dance including the original 162 Sooththirams of first part. However I feel there are some more sections missing in same, when compared with the classification of the chapters made by Thiru Yogiyar himself based on the Ola Leaf Manuscripts. I met the family members of Thiru Yogiyar in Chennai, but was informed the fate of the original Ola Manuscripts after the death of Thiru Yogiyar is not known. Hence I suggest a team of leading Dance Exponents of Tamil Nadu to get together, and obtain a copy of the (printed) second Part of this Treatise from the Tamil Nadu Iyal Isai Naataka Mantram - Chennai, study through them, and arrange the subject matter in the Text of the Treatise in accordance with the classification already made by Thiru Yogiyar, and bring forth this Dance Treatise in a format which will be usefull in preserving the ancient Dance traditions of Tamil Nadu, complete with explanatory notes on the Text prepared by this qualified team in Dance, for the posterity of the Tamilians and others, and for adoption of same into the modern 'Dance Forms' of Tamil Nadu. We are very thankfull to the great services done by Late Thiru Yogiyar and Thirumathi Yogiyar, by preserving and providing the Text of this great Treatise for Print - preventing it being entirely lost to the Tamils of Tamil Nadu and elsewhere in the world. We are also thankfull to the Tamil Nadu Iyal Isai Naataka Mantram - Chennai, for printing and publishing same, entirely at their own cost.